SRI has been implemented in Cameroon since 2013, although the British NGO Skills for Development began planning the promotion of SRI as early as 2011. 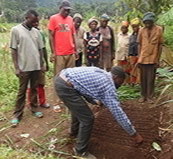 Henry Ngimbu from Zambia provided the SRI training to farmers in Ndop, Cameroon in 2013. The training was a collaboration between the Centre for SRI Initiation (CSRII) Zambia, Skills for Development, and technical support from SRI-Rice at Cornell University. Following the training, farmers were averaging yields of 8.2 tons/hectare. In 2015, Julius Fieshi, the coordinator of the SRI COOPBOD Group, wrote a report that highlights the yield differences between SRI and traditional farming methods. During late 2016, four SRI farmers in Ndop plus COOPBOD coordinator Julius Fieshi made a four-day trip supported by SRI-Rice to Mbueni in Boyo Division (November 29 - December 2) to provide training to farmers working with the NGO BARUDEV in the latter location. The photo at right shows the demonstration of SRI rice nursery seeding by Chia Bernard Ful, director of the Boyo Association for Rural Development (BARUDEV) at Eleh in the Mbueni community of Cameroon. Agriculture is its main activity, and rice is the main crop of this community. SRI is still very new to them and other rice-growing communities in Boyo District in north western Cameroon. BARUDEV, which collaborates with SRI-Rice at Cornell University and a farmers’ cooperative in the Ndop commune (Coop BOD) that previously received assistance from SRI-Rice. With training and advice from Coop BOD, BARUDEV is championing the introduction of the SRI in this community and will later be introduced in other communities. Two demonstration sites were set up to compare sowing seeds at random and seeding in lines as with SRI. This is phase two of an effort to get SRI known and utilized through farmer-to-farmer efforts. [December 26, 2016] At the end of November, four SRI farmers in Ndop plus COOPBOD coordinator Julius Fieshi made a four-day trip supported by SRI-Rice to Mbueni in Boyo Division (November 29 - December 2) to provide training to farmers working with the NGO BARUDEV in the latter location. Their report provides details on what was a logistically difficult trip but which was successful in conveying knowledge and building interest in use of the new methods. NDOP SRI Project Shows Points to SRI Advantages Over Conventional Production Methods [January 2015] Julius Fieshi, coordinator of SRI COOPBOD Group, Ndop, Cameroon, trained farmers on SRI methods and reported on harvest evaluations for two farmers in Ndop. The January 2015 report highlights yields received on an SRI plot, compared with a neighboring plot that used conventional rice farming methods. The rice in the SRI plot had over three times as many tillers and panicles as the rice grown conventionally, with the average SRI pannicle being 40cm longer and having 59 more grains per pannicle on average. Although the size of the plots were different, Fieshi conducted a labor cost evaluation for the two plots, finding that the SRI plot generated more cost benefit than conventional methods. (See report for details.) There is a video of Ndop farmers discussing SRI. Cameroon’s first-year demonstration trials, which were managed by three women's clubs, achieved an average yield of 8.2 tons/ha as opposed to their previous paddy yields of 3-4 tons/ha; only 6% of the members had previously ever achieved yields more than 5 tons/ha. The participating women's groups included the Makew Women's Group, the Tianghou Common Initiative Group, and the Church Street Women's Group. At the end of the project, a new organization encompassing the three women's groups and other interested farmer groups to be engaged in SRI farming methods was established and registered with the Government of Cameroon on December, 20, 2013. The new entity is called Ngoketunjia System of Rice Intensification Producers and Marketing Group (COOPBOD). Participatory capacity-building training in SRI was carried out in the commune of Ndop, Cameroon, by the Centre for SRI Initiative (CSRII), Zambia. The program was managed and sponsored by the NGO Skills for Development, with technical support from SRI-Rice at Cornell University in the USA. Others involved in the development of the project included PAN AP, the Cameroonian Government Rice Development Organisation UNVDA and the local Cameroonian NGO FAP. Three training visits were made during 2013 by Henry Ngimbu from Zambia to Cameroon. The first trip in May involved SWOT analysis and introduction of SRI to the three farmers groups participating in the SRI project. During June, the farmers learned SRI methods and set up their plots using the Farmer Field School (FFS) approach. Finally, progress was evaluated during a third trip that began in October 2013. The initial results by the three women's clubs registered yields ranging from 4.0 to 12.8 tons/hectare, generally much larger than their previous paddy yields less than 4 tons/ha. Tianghou Common Initiative group managed to produce the highest paddy rice per unit area, 6 tons/ha, while the lowest was 2.8 tons/ha. 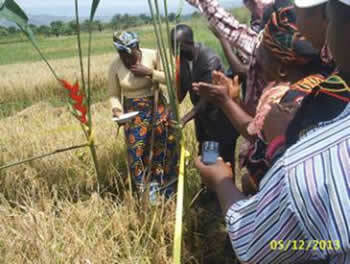 This was followed by Makew women's group, which recorded a high yield of 9 tons/ha and low of 7 tons/ha. The Church Street women's group had yields only ranging from 4 to 7 ton/ha which was attributed to stress to the seedlings due to transport difficulties. The overall average of 8.2 tons/ha, however, was considered a remarkable improvement upon previous production. To celebrate the impressive harvest and the launch of SRI farming in Cameroon, an inaugural ceremony was held on December 5, 2013, at Njama-Njama Park in Ndop farms, Cameroon. Shown at right is the guest-of-honor, Wilson Ebi, Deputy Divisional Officer of Ngoketunjia division of the Cameroon Government, cutting the ceremonial ribbon. 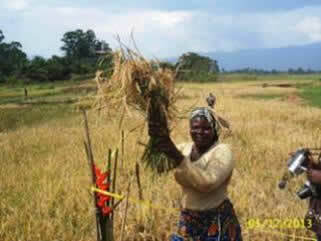 Memuna, president of Makew women's group, is shown at left lifting up the 70 tillers from the first SRI harvest in Cameroon. The ceremony attracted hundreds of people involving government representatives, civil society, media, and farmers in Ndop. There are challenges to achieving widespread adoption of SRI in the project area. The Ndop Plain in Cameroon where SRI was taken up by the women's groups has a history of this land being heavily reliant on chemical fertilizers, pesticides and herbicides. This has contributed to the exhaustion of this land, which was probably due to depleted soil biological richness that contributed to poor rice crop growth. Organic manure was applied to improve the soils, but this needs to be emphasized in the next season to build back the fertility of soils. In addition, access to appropriate and reasonable farm tools needs to be addressed, as this will aid in the adoption of SRI in Cameroon in the future (See report for more information). Julius, Fieshi. 2015. Report on harvest evaluations for two farmers in Ndop, Cameroon, January 1, 2015. SRI-Rice website. January 1. Palamakumbura, Tamara. 2014. Training of rice farmers in Ngoketunjia, Cameroon. Skills for Development website. Palamakumbura, Tamara. 2012. Introducing SRI to Cameroon. LinkedIn discussion on the SRI-Rice LinkedIn Group. April 18. 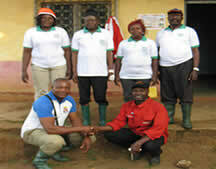 Ndop Rice - Helping the rice farmers in Ngoketunjia, Cameroon. Ning Group website managed by the NGO Skills for Development. Ndop Rice photo gallery on the Skills for Development's Ndop Rice Ning site. 2014 (February 27). Bamunka (Ndop), Cameroon (2014): Introducing SRI.1:10min. (A farmer from Ndop discusses her SRI test plot and interest in expanding to larger fields).